The average office worker doesn't use all of a high-end PC's power; it's difficult to buy a new computer that won't perform well running an office suite or accessing a network. the feel of the keyboard than on having a superfast microprocessor. 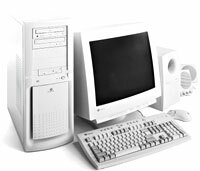 A Gateway GP7-550sE comes with a 550-MHz Pentium III processor, 4.3G hard drive, 32M of RAM and a 15-inch monitor. It's priced at $1,099. Some low-end PCs include monitors, but if the computer will be used several hours daily or more, upgrading to a better monitor is always a good idea. New keyboards cost as little as $10; many low-priced PCs come with one that doesn't cost much more, and anyone who will be typing all day will likely need a better keyboard. Many touch typists miss the solid, old IBM typewriterlike keyboards. Cherry Electrical Products of Pleasant Prairie, Wis., at www.cherrycorp.com, offers similar keyboards these days that cost upwards of $100. The way most users interact with a PC is through the keyboard and the monitor; a word processor's productivity does not depend on whether these are connected to a $3,500 1-GHz Pentium III PC or a $600 AMD K6 box. But it will improve with a larger monitor and a more cozy keyboard. Micron PC's Millennia Max comes with a 533-MHz Pentium III Processor, 10G hard drive, 64M of RAM and includes a 17-inch monitor. It's priced at $1,286. Companies can do several things to keep PC prices down and still deliver quality computers. For one thing, even if processor speed is important, the brand name isn't. Removing the 'Intel Inside' designation by choosing a processor from Advanced Micro Devices Inc. of Sunnyvale, Calif., with similar clock speed can save $100 or more. If you stick with Intel Corp. components, a Celeron runs most applications as fast as a similar-speed Pentium III. CPU clock speed is always highlighted in ads, but bus speed'the speed at which data can be passed between the microprocessor and RAM, hard drive and other components'is usually ignored. Both are equally important in a high-performance PC. Low-cost PCs have a 66-MHz or 100-MHz bus, which is fine for most tasks. Machines designated as home computers often have hot 3-D graphics cards, making them a poor choice for the office. Choosing a slower graphics card with less video memory can easily trim $50 from a system's price. Dropping legacy printer and serial ports in favor of USB ports can cut more than $100 from a PC's price without any performance compromise. Companies are introducing new legacy-free PCs that offer only USB connections. Vendors also trim prices by using slower hard drives. SCSI drives are the best choice for high-end systems, but an 80-Mbps SCSI interface costs $150, while a 66-Mbps IDE controller costs $50. A 2G Seagate SCSI drive costs $100, while a 10G IBM IDE drive costs $140 from the same vendor, JDR Microdevices of San Jose, Calif., at www.jdr.com. The bottom line: There is a difference between a $3,000 PC and a $900 PC, but the difference may not matter in your office. Look for a good match between processor speed, RAM speed, hard drive interface and bus speed. Buyers don't really need to pay a lot attention to this; vendors take great care to match component performance'except for processor speed, which they often push as a glamour selling point. When a model is available with a choice of processors, the middle speed will probably make the best use of the other components, but the slowest may well be fast enough for your office use. Beware, though, that not everything that lowers the price of a PC amounts to a bargain. Although there are a number of ways companies can keep the cost of a PC down without compromising quality, some companies save even more through poor quality control or poor support. A PC with a good reputation is easily worth an extra $100. Most software runs almost as quickly on a Celeron processor as it does on a Pentium III. Keyboard and monitor quality are more important, in many office settings, than processor speed. 64M of RAM is plenty for most users. Vendor support and quality control are critical considerations when buying low-cost PCs. Bundled software isn't free; don't get what you don't need. Don't pay for a modem or network interface card you don't need. Expansion is easier with Universal Serial Bus components, so it's less important to buy pre-installed devices you may never use. Legacy ports let you reuse legacy hardware such as keyboards and scanners, so you'll likely want both legacy and USB ports. Don't skimp on memory and hard drive capacity to get a faster processor. Don't try to force a bargain PC on a graphics professional; such units cannot handle the massive files and video demands. John McCormick, a free-lance writer and computer consultant, has been working with computers since the early 1960s.